· Analysis of video fragments (for the cases, when the control signals from the center are not sent). · DTMF tones, "GPI in VBI" commands - signals in the sixteenth line (vertical blanking interval, teletext line, Softel protocol). · GPI commands from the external devices. The principle of work of the technology for analysis of video fragments is the following: the SL NEO server that forms the broadcast at the regional station permanently tracks the input signal from the central station and verifies the video fragments previously recorded to the disk, with the content of the input signal. In case of coincidence, the server automatically implements program switching and sends the command for playout of the local ad block. The end of the ad block may be detected in the same way. In this case, the server will form a command to stop the playlist with commercials. You need to previously record the input signal from the central station. Then, in the window File Monitor of the application Air Manager, look through the necessary fragment and format it with the duration not longer than one second, export this fragment as a file to the server disk, into the folder C:\Program Files (x86)\SL NEO Media Platform\run\files. Recording is not necessary, if the appropriate media-file already exists. You may upload the file into the selected folder remotely, using the control web-console of the server (menu item Files/Upload file). Let's consider one of the possible modes of the server functioning: One input channel that receives signals from the center, one playout channel. When the playlist with regional commercials is stopped, the signal from the input is broadcasted to the output. When the playlist is being executed, file playout overlaps the input signal. For setting this mode, you should configure the playout channel and set a background source for it - the capture service will implement this task. You can configure this option from the control web-console of the server - menu item Status, window Program 1. You should choose the item Background in the window, then specify the type of source LIVE for it and choose the appropriate capture service. The system of rules and commands (Action) of the SL NEO media-platform allows the user to form a command in one server module and send it to another module. The Capture service constantly analyses input video and compares it with the recorded fragment. In case of coincidence, the Capture service forms a command and sends it to the service of executing the playlist (Program Channel). You can adjust the rules for forming and passage of commands from the control web-console of the server - menu section Manage, tab Video IO Boards. Choose the item No actions Defined in the appropriate window of the capture service (Capture), then press Edit. Click Add Action in the opened window Edit Action, choose the type of analysis Video Detection and press OK. Enter the parameters of a new rule for controlling the analysis of the video fragment in the opened window. Find the field Name in the window Action Configuration and specify a random name for the rule - for example, START. Choose the clip for the analysis in the field Clip (from the list of clips previously uploaded to the folder C:\Program Files (x86)\SL NEO Media Platform\run\files clips). In the field Address set the IP address of the server, or leave the field empty, if the value is localhost. In the field Service press the button … and choose from the list the name of the service for managing. 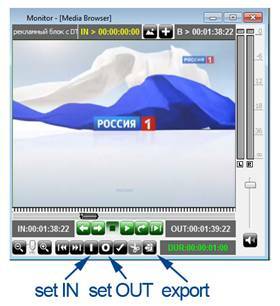 In our example, it is the playout channel #1 (Program_1 on the list). In the field Action choose the command that will be executed in case of coincidence - Play. In the field Action Parameters you may define a layer that will be used for passage of the command Play - “1” (the main fullscreen layer). Press Apply Changes at the top part of the server control console, to save the settings. Herewith, the configured capture service will be reloaded. 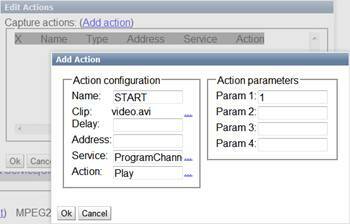 You may use the same way to configure a few rules for the start and stop of playlists, for several playout channels. The appearance of a playlist with ad blocks is displayed at the picture. The lines with the type of start Manual are used as separators. · The system on the basis of the SL NEO platform allows users to implement seamless insert of the local commercials: up to twelve SD programs or up to six HD programs simultaneously, in one system block. · The system implements insert of commercials with TS transcoding, meanwhile you may change the codec and bitrate, or overlay tickers, logo and graphics to the passing and replaceable content. · It works in the networks with DVB ASI/IP and SD/HD SDI interfaces, with the possibility of cross-conversions ASI-IP-SDI. · Manual and automatic load of playlists and advertising content, transcoding files if needed, normalization of the loudness level. · Rebroadcasting teletext signals from the central station when replacing commercials. · The program bypass in the mode UDP IP Multicast, with the backup scheme N+N. · The hardware bypass in the ASI and SDI modes (the relay in I/O boards, or external devices). · The technology “client-server”, monitoring and managing the unlimited number of SL NEO media servers. · The built-in protected content storage, content management with the help of the built-in DBMS in every SL NEO server, integration with external systems for storing content (NAS/DAS).